The creamy richness of whole milk may tempt you to pour it in your cereal bowl unless you stop to consider the fat content. Americans purchased about 5 percent less whole milk in 2010 than in 2009, according to statistics from the U.S. Department of Agriculture. The fat and calories in whole milk may contribute to the decline in consumption, as the USDA recommends that you choose low-fat or nonfat milk over whole milk in most cases. The majority of milk in America comes from dairy cows, although you can find goat's milk in some regions of the country. Whole milk in grocery stores undergoes a pasteurization process designed to eliminate dangerous bacteria. The USDA's standards for whole milk state that the milk must have at least 3.25 percent milk fat. In comparison, fat-free milk gets less than 0.2 percent of its calories from milk fat. All milk undergoes a separation process before being pasteurized. 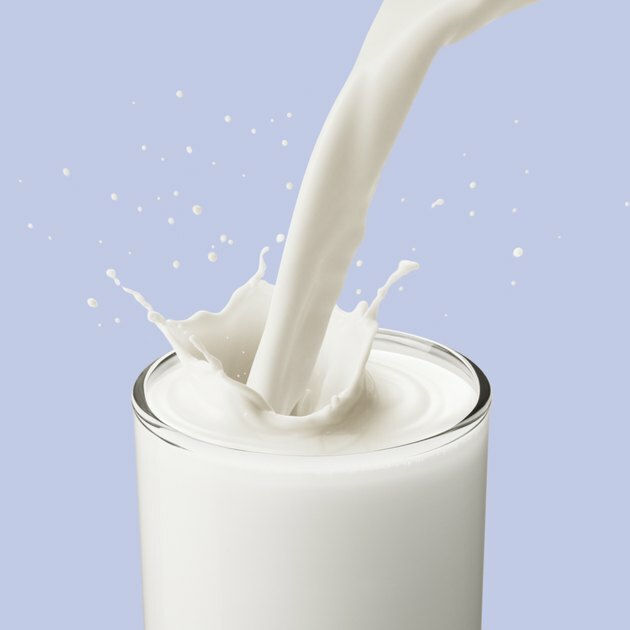 Some milk has the vitamins A and D added to improve its nutritional benefits. The USDA Nutrient Database indicates that 1 cup of vitamin D-fortified whole milk contains 8 grams of total fat, about half of which is saturated fat. About 48 percent of the calories in whole milk come from fat. Other nutrients include 8 grams of protein, 12 grams of carbohydrate and 12 grams of the naturally occurring sugar, lactose. A 1-cup serving has 276 milligrams of calcium, 105 milligrams of sodium and some B vitamins. Perhaps more important than the amount of fat in 1 cup of whole milk may be the type of fat in the milk. The American Heart Association advises limiting your intake of saturated fat to just 7 percent of your food calories. Whole milk gets 57 percent of its fat calories from saturated fat and the rest from monounsaturated and polyunsaturated fatty acids. If you eat about 1,800 calories a day, you can have just 126 fat calories from saturated fat, and 2 cups of whole milk exceeds that limit. If you need to gain weight, including small amounts of whole milk in your diet can help you increase your caloric intake. Small children under the age of 2 years old should drink whole milk rather than skim or reduced fat milk, according to the National Institutes of Health. Make the change from drinking whole milk to a milk with less fat content easier by diluting 1 cup of whole milk with 1/4 cup of skim or 1 percent milk. Over time, use more of the lower-fat milk and less of the whole milk until you become accustomed to the difference in the flavor and creaminess. U.S. Department of Agriculture: What Foods Are Included in the Dairy Group?